PROXYCO is pleased to present Flight Patterns, an exhibition of works by Juan Fernando Herrán that includes photography and video. The works on view explore the phenomenon and legacy of the sicario (the hitman), especially the construction of a psychological and social identity, a way of life, and a form of power, which confers prestige in a given area and in a certain social context, and in which the motorcycle has a huge symbolic value. 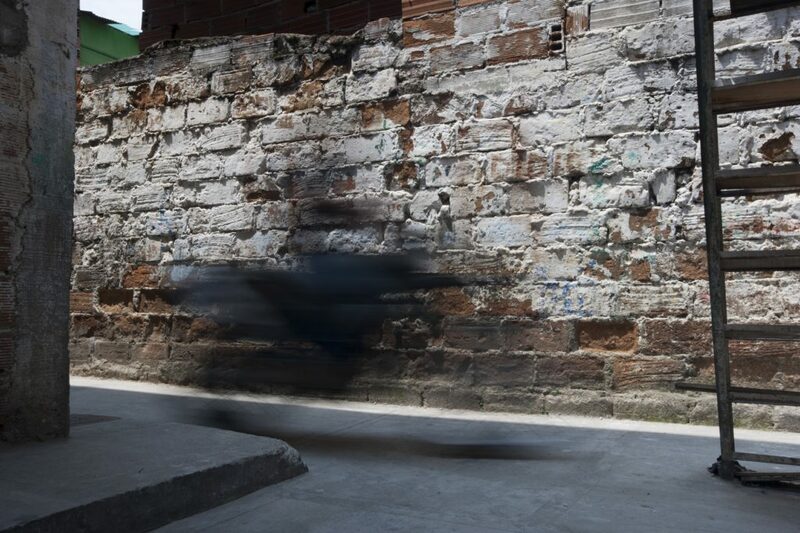 The photographs in the series Modalidades de vuelo (Flight Patterns) present contemporary youth on their motorcycles, bursting out of alleyways, corners, and paths of poverty stricken neighborhoods. The speed of the motorcycle is a potent symbol in Colombia that resonates with young people who long for the freedom and independence a bike represents. A motorcycle rider, like a hitman, has escaped a quotidian asphyxiation—a life without economic or social alternatives. In the photographs, the riders’ appearance is sudden, blurred and ghost-like. Their uncertainty contrasts with the sharpness of their surroundings. The images show the hallucinatory and addictive experience of speed, vertigo, and exaltation that provide an escape from disillusionment and indifference. Through interviews with former hitmen, the documentary La Vuelta (Doing the rounds) examines the relationship between the hitman and his motorbike from both a historical and psychological perspective. The narratives told in the film reconstruct the cultural context of drug trafficking in the late eighties and early nineties, tracing how this way of life formed a social identity related to a persona associated with power and prestige whose legacy lives on.